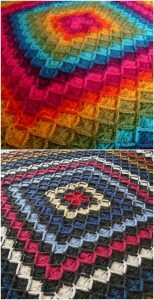 Today at the pretty-craft.com we have another amazing blanket crocheted using Bavarian crochet stitch. This is my most favorite crochet techniques. Squares crocheted using this technique are more beautiful in reality, than here on the pictures. Trust me, you will surprise everything if you will crochet this blanket, it is so universal, that you can use it everywhere you want, even a wall decor, my friend is using it like this and everybody likes it. The pattern is full and here are clear directions about how to crochet this blanket, so you can create it with no problems in the working process. Special Thanks to Sarah London for sharing this pattern for free, wish you a good day!